You can use the Roles pane of the Timeline Index to view and play back clips by role in the Timeline. All video and audio clips are organized by the default roles of Video, Titles, Dialogue, Music, or Effects, or by a custom role or subrole you’ve created. 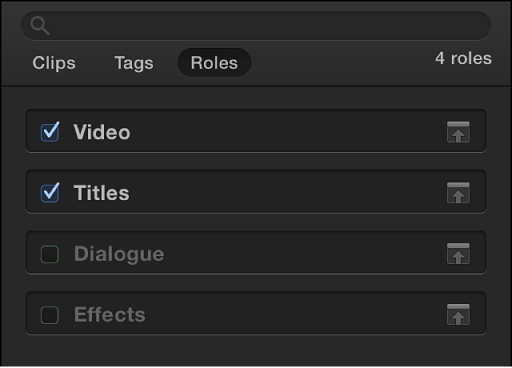 You can turn off roles to suspend playback for all clips with those roles assigned. For example, you could turn off all roles except Dialogue to play back only dialogue clips, and then turn on the Music role to listen to the movie soundtrack along with the dialogue. Roles give you a powerful way to organize and preview clips before exporting them as files for broadcast or audio post-production. Note: Turning roles on or off in the Timeline Index does not affect export settings or clip settings in the Browser, the Timeline, or the inspectors. In the Timeline Index, click the Roles button. In the Roles pane, select the checkboxes next to the roles or subroles you want to turn on. Deselect the checkboxes next to the roles or subroles you want to turn off. Active roles appear in color in the Timeline, and inactive roles appear gray. If you turn off all video or all audio roles, the respective portion of audio-video clips also appears gray. To preview clips by role, play back your project. Only clips with active roles assigned play back. In the Roles pane, click the name of the role you want to highlight. The clips with this role assigned are highlighted in the Timeline. This includes both active (color) clips and inactive (gray) clips. Tip: To highlight more than one role at a time, Shift-click to select contiguous items and Command-click to select noncontiguous items. 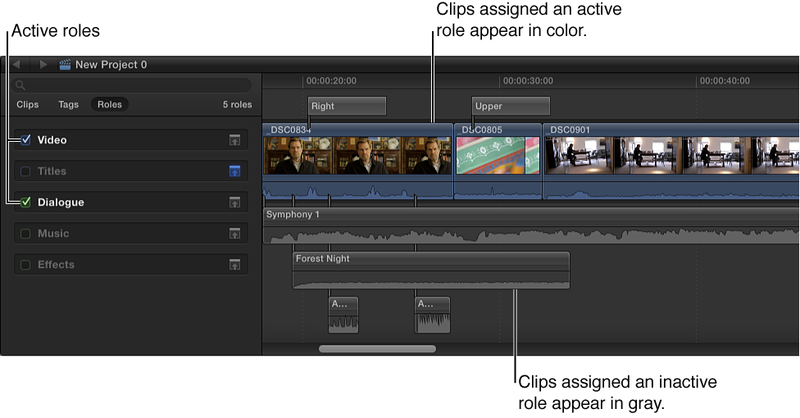 To make more space to view and work with clips in the Timeline, you can minimize clips with a particular role assigned. Minimized clips appear smaller in the Timeline. In the Roles pane, click the Minimize button next to the role whose clips you want to minimize. You can also customize the display of clips in the Timeline by changing the clip appearance and height, and you can choose whether to view clips by name or role. See Adjust Timeline settings.